August 2012, 4 months after diagnosis. You can't really appreciate in this picture how thick his coat was. You could almost lose your hand in the unclipped coat. 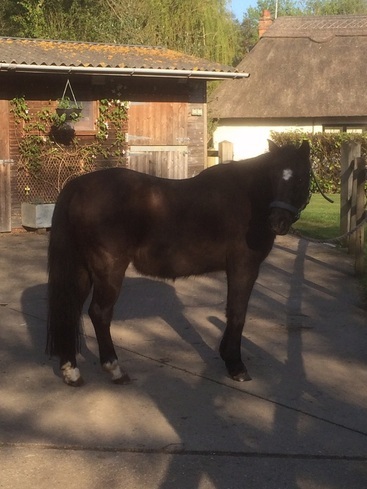 About eighteen months ago Widget, aka “The Diva Pony”, was diagnosed with PPID. 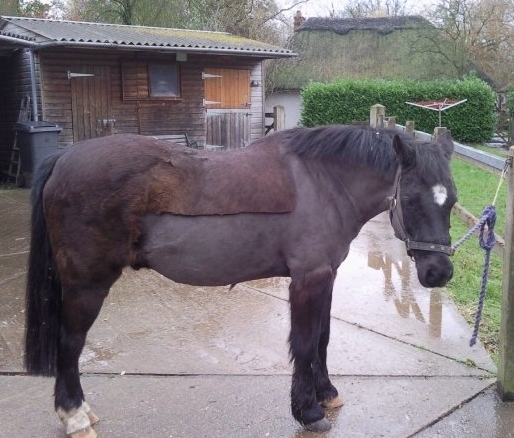 He had refused to shed his winter coat and was quite lethargic and miserable looking, and had suffered a mild case of laminitis in the early spring when we had snow. Gordon, my wonderful farrier and friend for many years, sorted his feet out despite x-rays that were so blurred it was mostly guess work as Widget refused to keep his feet still even when sedated, much to the vet’s frustration! Thankfully with expert trimming he became sound in a couple of weeks. I called my vet down again once he was sound and we both agreed that he was exhibiting several symptoms of PPID and that we should start a course of Prascend immediately. So we started on half a tablet a day and agreed to run bloods after eight weeks. He didn't appear concerned regarding EMS as he had no noticeable clinical signs such as fat pads and he wasn’t overweight. 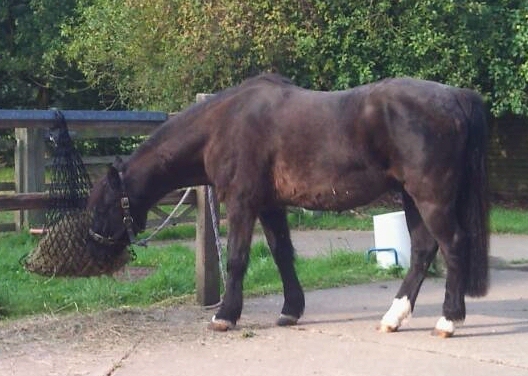 I had always been told to give very little in the way of feed and hay, for fear of laminitis, so his diet was a bare minimum with very restricted turn out and days of standing in his stable looking glum and hungry. He has to be clipped as he sweats, plus turn out rugs made the sweating worse and then if he went out naked in the rain I was worried he would get a chill as his coat was so very thick and one of the symptoms of PPID is a lowered immune system. 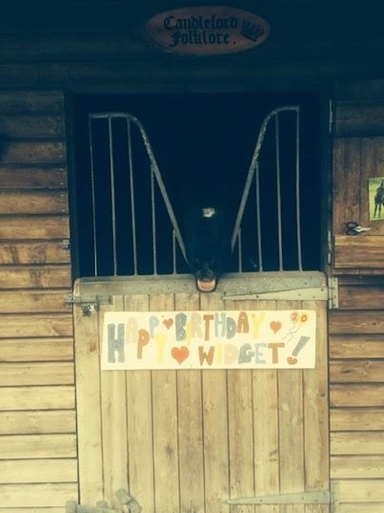 Widget is a home bred 12.1 part reg Welsh section B .. I had also owned his mother since a foal and they had both competed in in-hand and ridden showing at county level and had been very successful. Sadly I had lost his mum Weeble aged 24 several years ago because of PPID as back then the information available was very sketchy, so I was terrified of losing him too at eighteen. PPID is a lowered immune system. So .. eight weeks after the start of the medication Widget had to have bloods taken to assess his ACTH levels. Let me explain something about the Widget bless him.. he hates every thing you do to him, e.g. clipping, trimming, bathing and hates being turned out with others as he is always bullied and gets badly bitten and has his rugs ripped by his field companions, and as he was gelded at three he was used to being turned out on his own and was happier with his own company ... but vets.. oh boy vets .. he really hates vets and gets extremely stressed and aggressive. So I have to orally sedate him with Dormosedan Gel before the vet arrives. By sedating him he knows the vet is coming.. I swear he grows to fourteen hands as soon as the vet arrives and by that time he is sweating and spinning around the stable like a “whirling dervish” and wanting to kill the nearest bystander by doing four hours of “Riverdance” in twenty seconds. He then has to be sedated by the vet so he can draw blood safely (also a good time to do a super speedy clip on a sweaty pony afterwards!). So the ACTH results came back from Liphook at 300 pg/ml. The vet suggested that we increase the dose of Prascend to one tablet daily and re-test in three months as Widget’s syptoms had not improved. Luckily Widget hasn’t experienced the “Pergolide Veil” at any time and eats well. Three months passed and we went through the same distressing scenario of sedating him and him trying to kill the me and the vet. The ACTH came back at just under 900 pg/ml and my vet suggested euthanasia!!!. I was heartbroken and I refused point blank, and I asked the vet if we could again increase the dosage of Prascend to one and a half tablets a day and see what happened. He agreed but was quite dismissive, but I had to try ... and I scoured the internet looking for help. 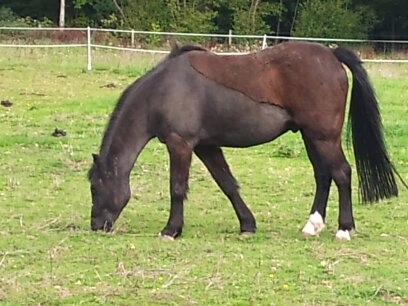 Then I found on Facebook the EMS, PPID and Laminitis Group and I asked for help. I poured my heart out and for the first time since diagnosis someone actually listened! The EMS Group suggests that stress could be contributing to the high ACTH results! Suggestions were made that I change his feed and start using Dengie HiFi mollasses free, Spillers Lite balancer with added salt (plus access to a pure salt lick) and micronised linseed, and to soak his hay (which I always did anyway - he had 9lb dry weight at night in a “greedyfeeder” hay net ). I followed the suggestions and within a few weeks I started to notice a difference. His coat, although very thick in the unclipped areas, started to shine and his demeanor changed. He had more to eat than he ever had before due to previous ill advice. Thank goodness, I thought.. things are looking up! Then I was told by the landlord who owns my grazing that he would be topping the paddocks with a flock of sheep. The sheep grazed for a month next to his paddock.. Widget was turned out every morning and didn't really move from the same spot in his paddock, he just grazed in a very small area and spent the rest of his time staring at the sheep intently, I wasn't sure if he was terrified by them or fascinated, but by the end of the month the sheep went and he had dropped so much weight that he could have gone down a rug size .. so I assume terrified was the answer! It took two months for him to recover most of the weight he dropped. He was in no way fat to start with and he looked awful, you could see every rib and his hips became quite prominent.. his body score had gone from 2.5 down to a 1.5. I cried as he looked awful but I didn't panic .. I knew I could rely on help from the Laminitis Group ladies. So I asked if I could increase the micronised linseed powder, which I did, and I increased his night hay to 11lb dry weight. He started to improve within a few weeks and was back to his happy self. This spring for the first time in three winters he is shedding his coat like mad (just like he used to) and I am coming home from the stables wearing as much of his hair as he is! He is bright.. mischievous .. sound and happy. I am hoping my vet will allow me to keep on with the Prascend with the minimum amount of regulatory blood tests as I may have to ignore the ACTH levels somewhat because of the stress he suffers by drawing the blood and rely on the overall picture of weight/demeanor etc instead. April 2014 - half of his winter coat has come home with me! Twentieth birthday 30 March 2014 and poking his tongue out to the vet! I realise that every horse and pony is unique and their symptoms and responses to medication/diet and other outside influences differ, but there is light at the end of the tunnel.. it's hard work, mentally exhausting and heartbreaking at times and I am crying as I type this as Widget the “Diva Pony” is my world (sorry Hubby!) and I will do everything in my power to have him happy and healthy for as long as I am allowed to. On Mothers Day this year Widget celebrated his 20th Birthday with an extra carrot and a small apple and I celebrated too with lots of wine! Hand on heart I never thought I would see his 20th birthday... and I now dare to hope for his 21st!! I would like to thank Andrea, Karen and Claire from the EMS Group and The Laminitis Site for listening to me, helping me and allowing me to breathe and not panic and being there for me on my lowest days.